Please advise of your charge for delivering HP 56 and 57 ink cartridges to Sweden? Using your HP Photosmart 2410 all the time for a number of different projects is the best idea you can have because of the Photosmart 2410’s extremely user friendly design. Economical with space, the HP Photosmart 2410 is capable of scanning and faxing as well, so you know that you can get any work done when the HP Photosmart 2410 is around. Always using your HP Photosmart 2410 can be a problem, however, because the HP Photosmart 2410 uses a number of HP Photosmart 2410 cartridges to perform, such as the black HP Photosmart 2410 ink cartridges. These HP Photosmart 2410 cartridges need to be replaced after regular use because HP Photosmart 2410 ink doesn’t last forever and a lot of Photosmart 2410 ink cartridge retailers overcharge for their range of HP Photosmart 2410 ink. We, however, believe that you should be able to use your HP Photosmart 2410 without paying too much which is why you can get cheap Photosmart 2410 ink cartridges from us at amazing discount prices! You can rest assured that when you buy your HP Photosmart 2410 ink from us, we’ll make sure that you don’t experience any annoying inconveniences. Ordering our HP Photosmart 2410 cartridges from our secure server is completely safe and you also have the option of placing an order for the Photosmart 2410 ink cartridges over the phone on our customer support line. We want you to be able to buy the cheap HP Photosmart 2410 cartridge without worrying whether the HP Photosmart 2410 ink cartridge is completely functional, so we have a standard money back guarantee policy for all the Photosmart 2410 ink, allowing you to try out your new HP Photosmart 2410 ink cartridge and seeing whether it works for you. Don’t forget, our HP Photosmart 2410 cartridges come with free delivery, helping you save that little bit more. This all-in-one device is a powerhouse for photo printing and handling other small-office tasks. Aside from a copier and scanner, the Photosmart 2410 also has a speedy fax machine to make it more efficient in the workplace, but it is somewhat pricey and needs improvement in some hardware aspects. The manufacturer integrated the revolutionary drop-on-demand thermal inkjet technology into the HP Photosmart 2410 to lower the ink costs. The duty cycle of 5,000 pages per month makes it suitable to average-volume printing, and users have the option to use two-sided printing to save paper. The copier has a decent speed of up to 21 ppm, and the scanner is integrated with the ReadIRIS Pro OCR software so you can edit scanned documents later using a word processor. 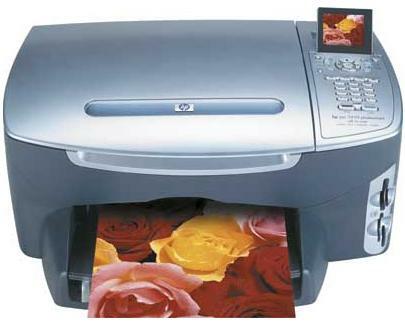 The 36.6 Kbps fax machine can handle colour messages and gives you activity and confirmation reports. Installing the HP Photosmart 2410 is easy and fast; it only takes 10 to 15 minutes, and even shorter if you are using a Mac. Many users are impressed with the scanner and the direct-printing capabilities of this printer. The uncluttered control panel of the HP Photosmart 2410 is also easy to navigate. Error messages, paper jam, and system hang-ups are among the drawbacks of the HP Photosmart 2410. The preview screen needs to be bigger, too. Some consumers also criticise the high initial cost of the HP Photosmart 2410, especially because there are many other multifunction printers with the same capabilities at a much lower price. Faxing multiple pages also requires manual work, which can be a hassle if you have other things to do.